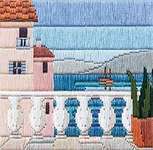 Long Stitch is a counted thread stitch and is often overlooked in favour of its better-known cousins. 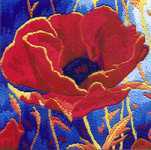 Long stitch offers a quicker way to cover an area of fabric and the resultant colour is more intense. 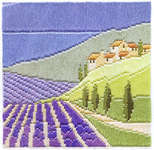 Long stitch kits contain fabric (usually printed Aida or Evenweave), thread/floss, a needle and full instructions. 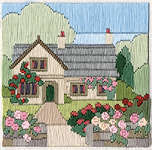 We offer only branded, genuine and original long-stitch kits. Our prices are heavily discounted and shipping is free - wherever you live. 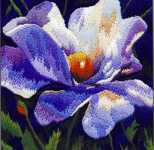 Jean Coates is an English designer with a range of very stylish floral designs, some in the C.R.Mackintosh idiom and some after Tiffany. 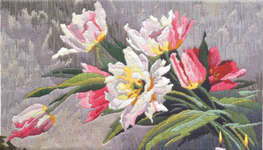 Sue Dakin is a specialist long-stitch designer with a range of pastoral, industrial and wildlife images. 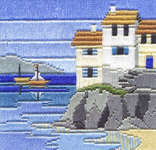 Rose Swalwell of Derwentwater Designs has a range of English country and seaside themes in long-stitch. Anchor offers a range of long-stitch kits featuring popular characters from Disney, Beatrix Potter, and Shaun the Sheep. 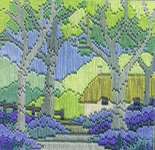 Clarice Cliff, known for her art deco ceramics, is also featured.